For the longest time, we operated on a “given bottle” basis. We’d make a suit for an interview or for a wedding and the client would gift us something for the bar cart. Typically, we’d put the bottle in the back of the store and wait until that client came back in. We’d share a glass together and then it would go on the bar cart for other client’s to enjoy. At one point, we had roughly 16 bottles on hand. We’ll still accept gifted spirits in the shop (😛). But recently, clients have seen a more unique set up on the bar cart. This March, Treaty Oak Distilling launched distribution in Chicago. BLVDier is proud to announce we exclusively feature all 6 spirits offered by Treaty Oak. Out of Dripping Springs, TX and from founder Daniel Barnes, Treaty Oak is a 13 year old distillery that shares the same ethos as BLVDier. They care just as much about who is drinking their spirits as what that person stands for. It isn’t just about whats in the glass, but the company sharing a drink. They care about transparency in their industry, being sustainable and, of course, having a good time. BLVDier was founded 8 years after Treaty Oak, without knowing it was even around. But the shared similarities meant something to us. We want our clients to be hardworking, charitable and stylish. We want to break moulds in an otherwise cloudy industry. Our clients are men about town, as we have aptly named our company after them. We didn’t invent custom clothing like Treaty Oak didn’t invent distilling. But we can both carve out a new path so that the drinks in our client’s hands and the clothes on their backs are, well, better. Next time you’re in the shop, ask for the Antique Gin (it’s Kirsten’s favorite) or the Red Handed Rye with a little smoked orange bitters and a cube of ice. While there were several precursors, braces (or suspenders) were a ubiquitous men’s accessory during the 19th and 20th centuries. They were made popular by their function but were made available by Albert Thurston. In 1820, Albert set up shop in Londons’s Haymarket neighborhood selling fine accessories to men about town. He had a small shop for decades but became increasingly popular after the Great Exhibition of 1851. His braces have been worn by presidents, kings, princes and prime ministers and the company still operates today. Notably, Albert Thurston made the moiré braces Daniel Craig wore as James Bond in Casino Royale. Additionally, they also make a wide variety of styles with an innumerable amount of fabrics and customizations. We contacted Albert Thurston last year to make us a comfortable and adjustable elasticated option in three core colors. For $65, we offer navy, white and our best selling classic black braces. All are made in England with goatskin leather accents and braided attachers. All of our trousers can be finished with braces buttons by request. We think they make a rakish addition to any closet, with the black and white options being most appropriate when wearing formalwear. Daniel Craig as James Bond in Albert Thurston braces. While they were historically an undergarment, to be worn beneath a jacket and/or waistcoat, shirts have gained popularity as an exterior garment in the last 15 years. Don’t be mistaken, their purpose is still to be a base garment, protecting the jacket from one’s skin. As a matter of fact, the cuffs and collar of a dress shirt serve as a buffer so the jacket stays pristine. In the Depression, a man would buy a blue dress shirt at a store and wear it until the cuffs and collar were ragged. The fraying and discoloration was irreparable. Since he couldn’t afford a new shirt, he would visit a tailor and ask simply for new cuffs and collars. The tailor needed the business but surely wouldn’t have the same blue fabric as the body of the shirt. To solve the problem, he/she would use a simple white fabric. This look, most associated with Wall Street, was born out of poverty. It was easier to replace the cuffs and collar than it was to buy a new shirt. Nowadays, it’s easier to buy a new shirt than it is to buy a new jacket. We take just as much care designing and constructing our shirts as we do our jackets, pants and vests. We want to create a durable and mindful shirt that looks just as good as it performs. During a shirt fitting, we speak to clients about cuff size to accommodate watches, type of deodorant to mitigate arm pit stains and ways to clean the shirt to elongate its lifespan. We’ve designed 30 shirt collars and 15 cuffs so that clients may find their own personal style within the program. We allow clients to choose front plackets, sleeve plackets, collar stay preferences, buttons, monograms, yokes and pockets. There is an almost endless combination of customizations that can be chosen. One of the most personal choices a client can make is the construction of the cuffs and the collar. Our interfacing comes in standard, soft, firm as well as an unconstructed option. Typically the standard construction suffices, but our soft and unconstructed options can create wonderfully comfortable shirts. Furthermore, we use a French seam construction on our side seams. We set those into the gusset where the front hem meets the back hem of the shirt. This is all done for strength along with turning the bottom buttonhole on the front placket. Our collection of fabrics numbers in the hundreds from mills like Canclini, Soktas, Thomas Mason, Albini, Martin Savile and Luthai. They range in price from $150-$235 and, as always, we include the customizations with our pricing. Lastly, discreet branding is very important for our company especially on our shirts. To avoid discomfort, we move our label from the nape of the neck to the backside of the placket near the front hem of the shirt. It’s hidden so it won’t scratch. Our Made To Order shirts can be purchased here and appointments for new fittings can be be made here. Our business has thrived with one-on-one interactions with our clients. We prefer to fit each individual in person at our shop so that we can ensure fit and design each garment to our standards. As we come up to our 4th anniversary of being in business, we have now fit over 2300 people. We are consistently the most affordable custom clothing shop using a canvassed construction and European fabrics in the country. With that, we wanted to give those clients an even more convenient way to order clothing. Our Made to Order Program is a platform where we have designed clothing to be, above all, versatile. We decided to start with 2 overcoats, 2 sport coats, 2 trousers and 2 shirts. They are the essentials that we believe belong in your closet. Starting now, you can buy them directly from our website. When you place an order we’ll use your most recent fit profile. This is the most economically and environmentally sound way to buy clothing. These are garments that will fit the way you want them to fit and made one at a time. This way we eliminate the need to make dozens of styles of hundreds of garments just to have them hang in a storefront waiting to be sold. That is a wasteful and antiquated way to sell clothing. This program is the future. As long as we have stock of the fabric, the garments will be produced in less than 30 days. Most times, we’ll have them finished in 20. You can pick them up at our store front or select to have them shipped to your home or office. Each garment is made to our normal standards and can be altered if necessary. If you haven’t been fit in our store, you may schedule a 30 minute fit session with us. If you cannot visit our store, you may submit measurements for us to use to build a better garment than a typical off-the-rack piece. In the 1950’s, when the world became more dependent on petroleum products and plastics, fusible textiles were invented. This forever altered the course of suit making as we know it today. For more than a century beforehand, suit construction consisted of using a canvas on the inside of the garment. The canvas was often times made of wool and interfaced with horsehair or, as a less expensive option, linen. After being cut to size via a client’s pattern, the canvas was basted throughout the lapel, giving it the rolling shape seen on the finished garment where the chest piece rolls back creating the lapel. Basting the canvas by hand is laborious, expensive and time consuming which is why many suit manufacturers today have long since abandoned this process. That paved the way for the fusible to take over the marketplace. As an inferior construction option, fused suit jackets are much easier and less expensive to manufacture. The fusible is a poly textile that gets bonded to the exterior suiting material using heat. It tends to keep the wearer warmer than average due to a lack of breathability. Most notably, the chest can buckle at the innermost portion because of the plasticity of the chest piece. It is less malleable and, while looking stiffer/sharper from afar, is uncomfortable to move in. Once designed in our shop, we use a CAD program to print out the pattern and a Gerber machine to cut the canvas. The canvas is tacked at the stress points betwixt the outer suiting material and the lining inside the jacket. This being the “meat” to the sandwich, it gives the jacket structure and shape. It adds some memory to the garment, so it wears better with time and lasts longer. The canvas also breathes better than the alternative. Our canvasses come from Freudenberg, a German technology company. Coincidentally, the machines we use to baste the lapel come from Strobel another German company. The largest benefit of a canvassed jacket is the drape, contour and softness of the garment. It will fit better the more you wear it because of the pliancy of the canvas. Pictured below is a close up of the canvas, with the horse hair interwoven into the wool. It can do more for your closet, situationally, than any other tailored piece. Checked jackets (often times mill-finished and slightly carded) can be dressed up or dressed down. They can be paired with jeans or slacks, dress shirts and sport shirts. We love a nice green colored jacket. More often than not, green jackets go with every pant. This is a great example. Think about it: jeans, chinos, navy slacks, grey flannel trousers. Those are the core pants to any well-rounded wardrobe and a (dark) green plaid jacket goes with all of them. To the office, a meeting in said office, dinner, reunion…the list goes on. Hell, we suggest wearing it on vacation. Our jackets range from $625-$1595 and there are hundreds of fabrics that are arriving for Fall/Winter 2018. Make an appointment this month to have a jacket ready by November. Socks have played a large part in the wardrobe of men in the centuries they've been around. Importantly, they regulate body temperature, mitigate blisters and of course add a stylish bit of contrast around the ankle. Our new lines of socks are made in North Carolina by a third generation hosiery manufacturer. We decided to carry both mid-calf and over-the-calf iterations for clients on both side of the coin. Additionally, we have both wool blended and cotton blended fabrics. The wool blend is 70% wool, 29% nylon and 1% spandex. The cotton blend is 66% cotton, 33% nylon and 1% spandex. They fit shoe sizes 7-13 and can be machine washed at home. Lastly, we opted for a linked toe for durability for our hard-walking clients. Each pair retails at $22.50. Colors: black (ribbed solid and bird's eye), navy (ribbed solid and bird's eye), charcoal ribbed solid, blue melange & brown melange (seen below). We recommend matching socks to either your trousers (for a taller look) or shoes. They can be purchased in store or online. A mill that was started by Piero Perino in 1975, StylBiella has recently grown its swatch program to international markets. Specifically in the last two years, they've entered the U.S. market, making their exclusively Italian cloths accessible to domestic clothiers. Read more on their heritage here. They are one of the very few mills to make suiting, coating and shirting cloths which creates a one-stop shop of sorts. We added their full book of shirting materials this month, as the only clothier in Chicago to offer the book. Additionally, we carry their Palette, Perfection, Rainbow, Style, Noble Flannel, Cotton Life and Breath books. Founder of StylBiella, Piero Perino. The shirt swatches are comprised of our finest fabrics and retail for $235. Like all of our garments, pricing includes your customizations. Already have your fit profile saved in our system? Schedule a re-order here. 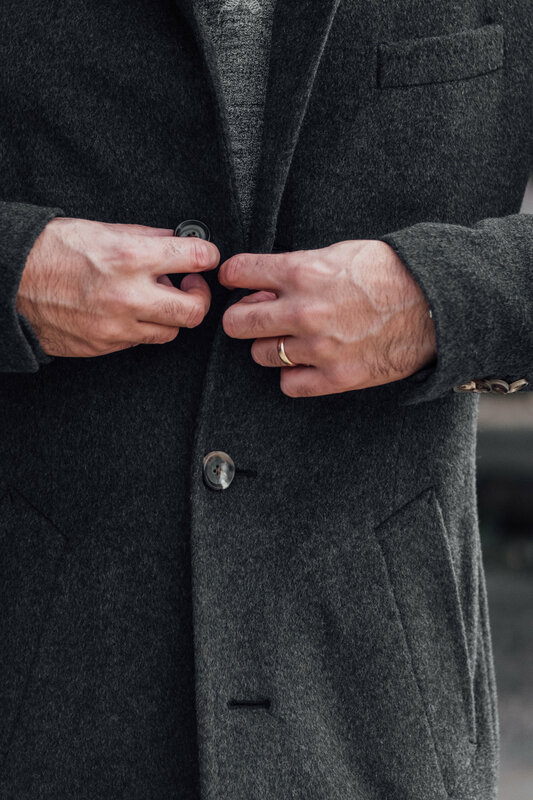 The decorative stitch along the edge of a jacket's lapel (and occasionally on pockets, sleeve heads, sleeves and side seams) is just that; decorative. It's an ornamental feature that was originally done by hand by skilled artisans. The issue with doing the stitch by hand is that, like all hand made attributes, it looks irregular and is often expensive to produce. American Machine & Foundry is a company that sought a solution to that problem. Founded in 1900, they made a plethora of goods including bowling centers, atomic reactors, tennis racquets and stitching machines. The stitch is now synonymous with the company, being referred to as an AMF stitch. Typically set at 2mm or 6mm from the edge of a seam, the stitch is a sign of a quality garment. Nowadays, most suits have some AMF (or pick) stitching as it has become a hallmark of tailoring. Some suit manufacturers choose to omit the stitch which is often referred to as a bluff edge. We offer all 3 options. Pictured below are prime examples of our 2mm and 6mm AMF stitch options. This month we're adding several accessories to our shop. We've sourced combs, collar stays and shoe horns from the storied Abbeyhorn located 5 hours north of London. Abbeyhorn has a long and rich history in the trade, having been in business since 1749 and being owned by multiple generations of multiple families. We opted to start with three core accessories for our clients. The materials are unparalleled in quality, being made from cow bone and buffalo horn. You can read about how Abbeyhorn sources their materials here. The 5 inch comb is compact enough to fit in any dopp kit, being much stronger than a resin comb where teeth can regularly break. We chose a comb that is dual sided for versatility and appropriately sized for a pocket or briefcase. Similarly, the shoe horn is 4 inches in length and comes with a strap to be perfect for travel. Lastly, the collar stays are made of bone and will not warp over time. All of these accessories are engraved in England and come in our reusable canvas bags. Each piece is unique, and due to variations in the horn, look different than the next. Any, or all, of them are great for groomsmen gifts, father's day gifts or as a treat to oneself. There exists a history, as old as the United States, regarding sheep farming. It involves several important figures, but none more famous than John and Elizabeth Macarthur. This article on the Australian government's website says it all, but it is important to note that there are over 200 breeds of sheep, with the Merino sheep dominating the fine woolen industry. As you can imagine, in hundreds of years of breeding, there have been many cross breeds produced. Especially because sheep are a nomadic species and travel well. But it was the Macarthurs who kept their flocks true blooded in Australia where the species flourished. Due to their strict breeding habits, we now have fine, superfine and ultra fine wool that are produced from Merino sheep. It was their determination and a perfect combination of climate and intelligent farmers that provides fabric mills the ingredients to produce woolen fabric as we know it today. From Super 100s to Super 220s, there isn't a fabric that doesn't appease the wearer. As the ultimate performance textile, wool at any fineness has the ability to retain heat as the crimped follicle holds air. Often times a coarser, thicker fiber is more apropos for suit construction. The heftier the fabric the better it tailors. Finer fabrics often show more puckers and wrinkles but because they feel nicer clients are apt to want them. And so a merino wool with a lower Super number yields a fine handle while also providing a cleaner looking garment. There is no right or wrong answer in choosing a fabric. Many of our clients choose fabrics based on color, pattern/weave and budget, but there's always more that meets the eye. In the hundreds of years of milling woolen textiles fabrics have gotten finer and finer. Suits in the 1800s were twice as heavy as they are now. Sheep are wonderful animals that have been around for thousands of years and farmed globally since the 1700s. The wool textile industry has been around since the 1300s. They have a huge impact on economies, religion, culture, science and even cuisines around the world. We encourage our clients to understand what the Super number of a suiting fabric stands for, we also encourage our clients to understand that the history of the woolen industry is similarly important. Often times we get asked, "What's the difference between a Super 110 and, say, a Super 150?" First, we have to start with what the Super number signifies. Originally, there were several different ways to measure the fineness of wool. This study from New Mexico State University does a pretty good job at outlining the beginnings of wool grading. Before the advent of certain technologies, there was a weight system using big spools of wool called hanks that held 560 yards of yarn. If a wool fiber was finer, more hanks were produced, eventually yielding a more luxurious cloth. Nowadays we use the diameter of the wool fiber, a measurement taken in microns (a millionth of a meter), to determine the fineness. For most of the fine wool in the world, that measurement falls between 12-20 microns, with the vast majority sitting between 15-18. That measurement is then converted back into the the original Super grading system. So, a Super 120's yarn equates to 17.5 microns and a Super 150's yarn equates to 16 microns. It is important to point out that these numbers have no relation to thread count, which pertains to cotton fabrics. It is also important to point out which mill mills the wool into a textile. Technically speaking, you can microwave wagyu beef. Or, it can be prepared by a chef. Which sounds better? The unspoken mission of most clients who enjoy the plight of custom clothing is to find a fabric that is fine enough while still remaining durable and cost effective. Sometimes it's finding a mill that makes fabric you like more than another, regardless of fineness. A Super 200, 13.5 micron wool fiber produces an incredibly luxurious and expensive fabric. It is also a fabric that cannot be beaten up. Typically, the higher the Super number, the less durable the fabric. A Super 130, 17 micron wool fiber is a wonderfully durable and fine yarn. However, some clients prefer a Super 120 or a Super 150. Which is better? It depends. Next time you're in the shop, ask to feel fabrics from each range and see for yourself. With a sponge-like softness, our knit ties are made in Salerno, Italy from 100% wool. 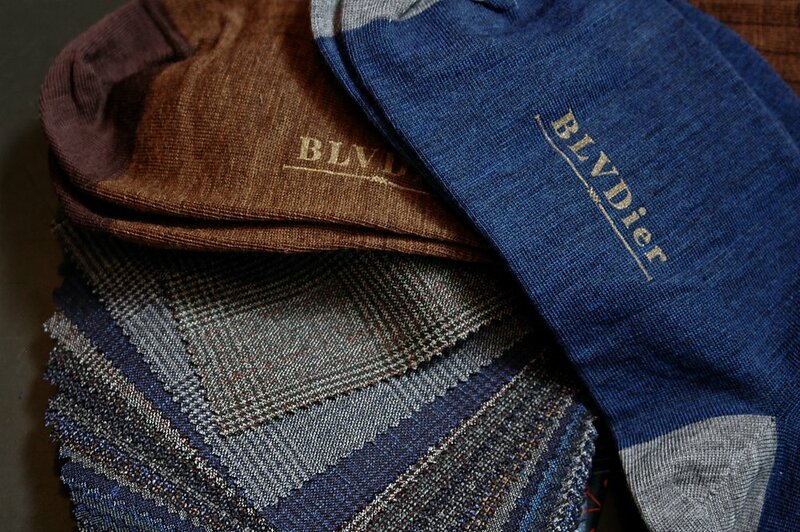 They offer the most amount of texture and durability you can ask for out of a tie and can be paired perfectly with tweed, corduroy and flannel. To be worn from Autumn until early Spring, we carry 4 colors of wool knit ties; Chocolate, Steel, Loden & Oat (pictured). Priced at $65 and sold in store in limited quantities. Quite often, a solid sport coat feels odd. A blazer, while one of the most versatile tailored garments ever invented, can feel stale if worn too frequently. The idea of a checked sport coat is exciting to most clients. There isn't a rhyme or reason to why they can work so well, but sometimes its simply that it's not solid colored. There's depth in plaids, window-panes and checks that solid colored fabrics can't hold a candle to. The fabric in these pictures has a creamy base when worn with blue jeans or navy trousers. But paired with cream trousers (above) looks grey. The colors represented atop the base are a dusty olive and a blue that looks like a laundry detergent. Easy colors to pair with navy and khaki. But they're also versatile in regards to shirts and ties. Upon looking closer, the blue is actually two blues; royal and sky. Checked fabrics are, simply put, more exciting. This jacket works with almost any blue shirt and almost any colored pant (black excluded). Next time you're hunting for a sport coat that adds depth to your wardrobe, ask us for recommendations. Hacking, or slanted, front pockets on a jacket are typical of country suits. The angle allowed a horse rider to access the pockets more easily but also kept the items inside the pocket more secure. As they are indicative of a non-city suit, they tend to add a slightly casual aesthetic to the jacket. Nowadays, hacking pockets are added to jackets more so because they appeal to the client looking for a customized look. Rarely are we riding horses whilst wearing a sport coat or suit, so the addition of the angle was more for looks rather than use. The above suit was made for a restaurant employee, who accesses the pocket very frequently. Designing the suit for ease of use whilst still looking good was important for the restaurant and the hacking pockets were the only "curveball" to the exterior of the suit. Slanted pockets tend to do two contrasting things to the silhouette of the wearer. They can accentuate wide hips as a negative (unless the wearer also had overly wide shoulders, in which case it can help balance out the garment). Conversely, they can direct the eye towards the middle of the abdomen and make the wearer look taller and slimmer. Either way, it is an option worth exploring for most clients looking for either a functional or aesthetic feature to their suit or sport coat. When referring to "ply," we almost immediately think of toilet paper. Not to say we shouldn't, as stacking wood or paper denotes a certain amount of plies that we associate with lumber and tissue. However, a piece of yarn can also be called a ply. That yarn is then loomed into fabric as we know it. A single ply fabric made of resilient and high quality wool is a wonderful textile. But of course that isn't the only way to mill fabric. A 2-ply (or 3 or 4 etc.) is made by twisting two single ply yarns together to create one yarn. This has a number of benefits, but the biggest advantage is that the yarns will perpetually want to untwist, which reduces and often eliminates wrinkling. And because of the way the fabric is milled, the yarns will never actually untwist. Another advantage is that while the fabric is heftier, the 2-ply construction is a more open weave. This allows air to pass through the weave and creates a more breathable textile. Pictured here is a 2-ply, or Fresco, fabric from Ariston. We used an Olloclip magnifier at 21x to view the individual warps and wefts. You can see multiple colors twisted into each yarn (cream/tan, grey/black, brown/caramel, royal/dusty blue) which only accents the depth of this particular fabric's color and pattern. Next time you're in the store, please ask to see the fabric under the magnifier to get a better understanding of how your suit is made. Wool is a perfect fiber. It has scales and is crimped, which are two key properties that allows woolen fibers to attach to one another. Typically, finer wools like Merino have more crimping which allows for a smoother and stronger finish to the fabric. The crimping also creates pockets in between the fibers which holds air and creates insulation. Additionally, the fiber isn't hollow, but absorbs up to a third of its weight in water without appearing or feeling wet. In short, it is the original performance textile. Much like whisk(e)y, wool is it's own highlight reel. However, many people would agree that Manhattan's and Old Fashioned's are great cocktails. To that end, when wool is blended with other textiles magic can be made. From cotton, silk and linen to mohair, acrylic and cashmere, wool can be blended with a wide variety of other yarns. Our fabric mills carefully design and combine colors, weaves, techniques and textiles to create fabrics for each season. The base, however, is almost always wool. This spring/summer season has plenty of options. There is linen galore but also browns and sky blue as well as plenty of checks and plaids. There isn't a wrong way to go, but playing with different fabrics can be exciting to figure out what's best for your wardrobe this summer. Born into a family of artisans, French weaver Joseph Marie Jacquard was a pioneer in the milling industry. He wasn't, however, the first of his kind. His predecessors Basile Bouchon, Jean-Baptiste Falcon & Jacques Vaucanson all advanced the mechanical loom and its processes. In 1801, Mr. Jacquard previewed his invention of automatically weaving silk textiles into fancy fabric in Paris and within years the "jacquard loom" was sold across Europe. While knitting only involves one piece of yard, the fabric below resembles that of a cable knit sweater. The jacquard process involves a complicated system of cards with punched holes that control the warp to weft ratio, raising only certain warps at a time to warrant creating a repeating pattern. As Napoleon Bonaparte was Emperor in 1805, he granted the patent to the city of Lyon and issued a pension to Jacquard. It was a step forward in the production of fabrics but also helped pave the way for programming and the invention of computers. Jacquard fabrics can be wonderful for curtains, dresses and ties. The Vitale Barberis Canonico fabric below is true in navy color and quite breathable with the open weave. It is best made as a casual and seasonal blazer.